Crimean Trolleybus Line (Russian: Крымский троллейбус, translit. Krymskiy trolleybus; Ukrainian: Кримський тролейбус, translit. 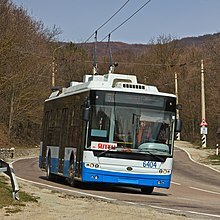 Kryms’kyi troleibus; Crimean Tatar: Qırım trolleybusı) in Crimea is the longest trolleybus line in the world. It is 86 kilometres (53 mi) long, between the capital of Crimea, Simferopol, and the coastal city of Yalta on the Black Sea. Managed by the public transport company Krymtrolleybus, it was built in 1959 in the Ukrainian SSR as an alternative to extending the railway line in Simferopol over the mountains to the coast. It opened in two parts: Simferopol–Alushta in 1959 and Alushta–Yalta in 1961. The journey time to Alushta is about ​1 1⁄2 hours, to Yalta about ​2 1⁄2 hours, and the fare is about 15 hryvnias (since March 2014—58 rubles). It passes through the Crimean Mountains across the Angarskyi Pass, reaching 752 metres (2,500 ft) at the highest point, then descends to the resort town of Alushta on the coast. The remaining distance to Yalta is 41 kilometres (25 mi) and winds around the mountains above the sea. Škoda 9Tr and Škoda 14Tr vehicles are used, being replaced from 2010 by Bogdan T601 and T701 trolleybuses. ^ a b c "The longest trolleybus line in the world!". blacksea-crimea.com. Retrieved January 15, 2007. ^ Murray, Alan (2000). World Trolleybus Encyclopaedia. p. 41. Yateley, Hampshire, UK: Trolleybooks. ISBN 0-904235-18-1. ^ Makewell, Roy. "Trolleybuses Over the Yaila Mountains". Trolleybus Magazine No. 193 (January-February 1994), pp. 2–16. National Trolleybus Assn. (UK). Wikimedia Commons has media related to Krymtrolleybus. This page was last edited on 16 December 2018, at 15:58 (UTC).